Kamehameha! From the Dragon Ball FighterZ video game comes this Super Saiyan God Super Saiyan Goku FiGPiN Enamel Pin. The premium hard enamel 3-inch FiGPiN is amazingly detailed and is able to stand up with the signature FiGPiN rubber backer stand. The pin comes displayed in front of a backer card and is fully capsulated in the ultra collectible FiGPiN clear protector case. Enhance your FiGPiN collector experience with unique ID codes on the back of each pin. The unique ID code will provide cool details such as the edition run, sequence number in the edition, artist bio, wave information, manufactured date, and rarity scale. 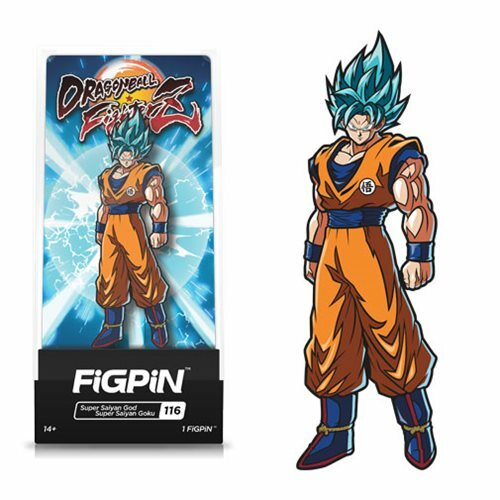 The Dragon Ball FighterZ Super Saiyan God Super Saiyan Goku FiGPiN Enamel Pin is #116 of the FiGPiN collection. Build and share your collection! Ages 14 and up.